The White-tailed Deer is a medium-sized deer native to the United States. 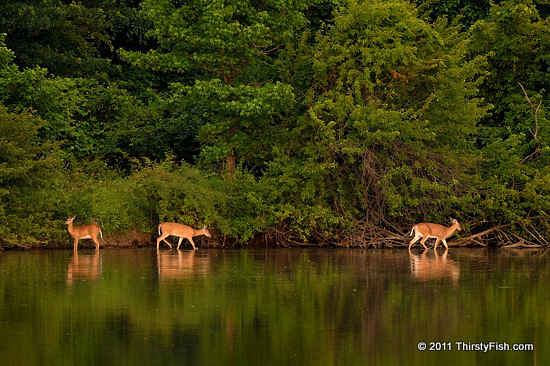 This photograph of the deer cooling of by the waterline was taken at the John Heinz National Wildlife Refuge. The Bambi Effect is an anecdotal term used to illustrate the hypocrisy in opposing the killing of animals that are perceived as cute or adorable, such as deer, while having little or no objection to the suffering of organisms that are perceived as somehow repulsive or less than desirable. Contrast the Bambi Effect with caging of animals because they are attractive or sing melodiously, and with, hunting birds for their plumes to decorate hats.